14 Jewish European organizations published a statement voicing their concern over the organization of a conference in Brussels backed by the Israeli government, aiming to label legitimate criticism and protest against Israeli governmental policies, including through Boycott, Divestment and Sanctions (BDS) tactics, as anti-Semitism. We reject their call. Antisemitism is a small but real and growing threat to Jewish populations in Europe – and elsewhere, as the recent outrage in Pittsburgh so tragically demonstrates. Conflating the real threat posed by anti-Semitism with legitimate criticism of the Israeli government and its policies is a dangerous step; it threatens to misdirect European efforts to combat anti-Semitism, turning these instead into a tool to erode the democratic principles of free speech and freedom of assembly, and to aid the Israeli government in its quest to limit Palestinian non-violent civil resistance to the Israeli occupation. These Israeli efforts do not represent the Jewish communities of Europe. The Israeli policies of siege in Gaza and racial segregation in the West Bank, of fatal attacks on civilians and of land expropriation for Jewish-only settlements – are not in our name. We reject attempts to equate opposition to these deplorable policies with anti-Semitism. 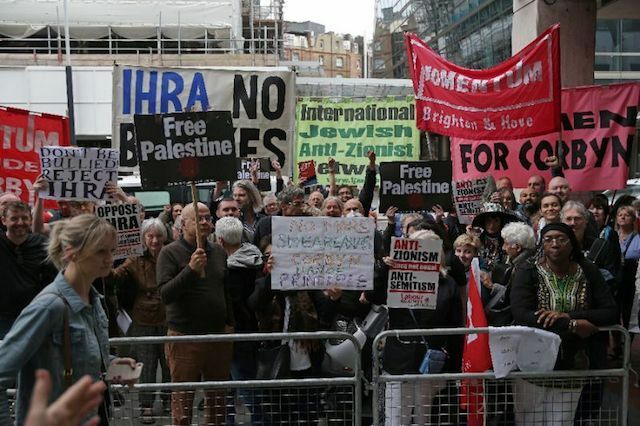 In the context of growing Israeli governmental ties with racist, sexist and xenophobic leaders, groups and political parties in Europe and the US (some of which with a past marked by blatant anti-Semitism), there is a real threat of emergent anti-Semitism. The Israeli governmental conference organized in Brussels is not searching for much-needed solutions to this threat. Sadly, it seeks instead to leverage anti-Semitism to maintain an untenable status-quo of occupation, oppression and fear in Israel/Palestine. We stand in opposition to their mission. The right to defend human rights, including Palestinian rights, should be safeguarded now more than ever. EU political parties have a responsibility to end complicity of their respective states with the Israeli violations of international law. It is time to act against anti-Semitism, xenophobia, Islamophobia and all other forms of racism. It is time to act against Israel’s decades-long occupation and racial segregation. Don’t lend a hand to the Israeli government attempts to stop us from doing both.